When using a user function in a query, why must I repeat the call to the function in the select, where and order by in PL/SQL? Why won't PL/SQL allow this? how to cook scallops on the half shell When using a user function in a query, why must I repeat the call to the function in the select, where and order by in PL/SQL? Why won't PL/SQL allow this? Call the function in a LINQ to Entities query. Example The following example demonstrates how to call a function that is defined in the conceptual model from within a LINQ to Entities query. 7/12/2011 · I have a SQL query that will return in less than a second or two with a function in-line selected in the "from" clause of the statement. As soon as I select that returned value in the SQL statement, the statement takes from anywhere from 2 to 5 minutes to return. Parameters. query. 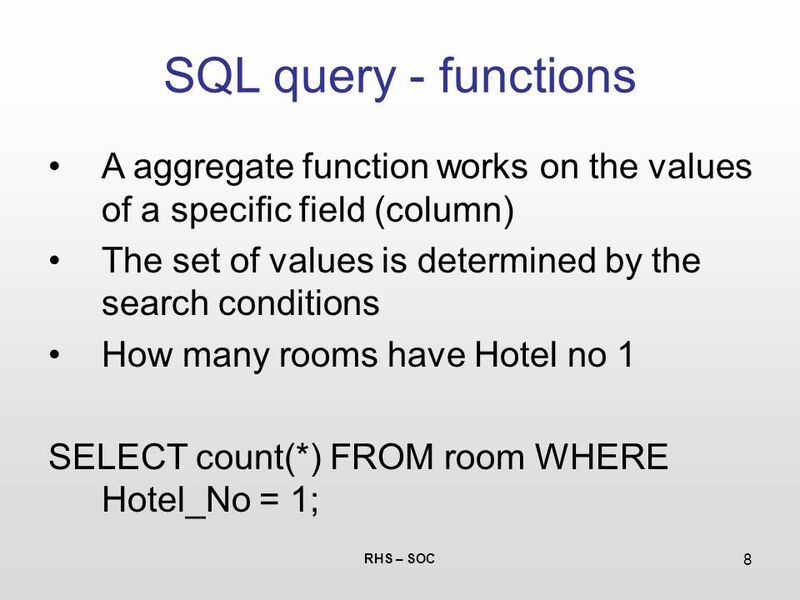 An SQL query. link_identifier. A MS SQL link identifier, returned by mssql_connect() or mssql_pconnect(). If the link identifier isn't specified, the last opened link is assumed.